The terminal's design is different from its older siblings in that it contains more natural elements. A large wall spanning 5m high, appropriately dubbed the "Green Wall", adorned the check-in and baggage retrieval area with hanging creepers. In the company of such lush greens and 4 cascading waterfalls, it is hard to imagine that you are in an airport and not in a jungle. 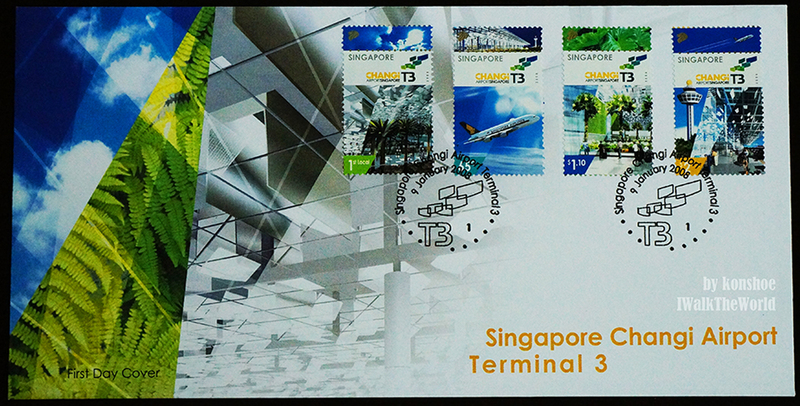 The stamps themselves reflect the unique design and features of Terminal 3. 1st Local: This stamp features the eco-friendly design of the terminal, with maximum utilization of natural sunlight through reflector panels and skylights. $0.65: This stamp showcases the pride of Singapore's Changi Airport - its ability and readiness to accommodate the largest civilian aircraft at that moment, with Singapore Airlines being its first customer to fly the plane. $1.10: This stamp once again highlights the airport's consciousness towards the environment. A "Green Wall" greets visitors arriving and leaving through the main doors with a wall of hanging creepers and cascading waterfalls. $2.00: This stamp features the iconic control tower and the interior of the terminal.